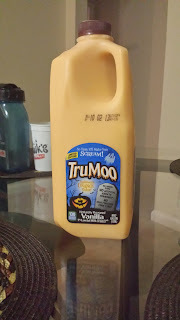 Halloween TruMoo Milk Review. Does it Have a Good Taste? A couple of days ago in the mail, BzzAgent delivered my packet of coupons and a free coupon to try out the limited time TruMoo Halloween Milk. 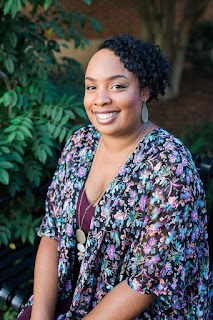 I told my daughters about it and they couldn't wait to try it out and I couldn't wait either! After work, I picked up my girls from daycare and we took a trip to our local Kroger with our free coupon ready to use. I went to the milk section of the store and found a half a gallon of orange vanilla flavored TruMoo Milk in stock. On BzzAgent's website, I seen TruMoo has another Halloween flavor that is chocolate but Kroger didn't have that kind in stock, but it wouldn't matter anyway since my daughters don't really care for chocolate milk. I got to the register and completely forgot to give the cashier my coupon for the TruMoo! I had other coupons I was using at the same time and thought I had the TruMoo coupon in my pile but that's ok because I'll use the free coupon on my next shopping trip. The milk is made with pure, fresh milk from your trusted dairy, no artificial growth hormones and no high fructose corn syrup, 35% less sugar than a leading chocolate milk brand. This makes me feel good to serve my daughters. With dinner, I gave my daughters and myself a cup of the orange vanilla flavored milk and it tasted pretty good to me. The taste was like a smoothe vanilla flavor. My daughters thought the taste reminded them of egg nog. They told me they wanted me to continue buying it. On the milk lid there is a peel off sticker to learn how you can enter to win a Goosebumps Haunted Hollywood Vacation and instantly get a $2-off coupon for any Goosebumps DVD with your next TruMoo purchase. Is Halloween TruMoo Milk Worth a Try? My daughters are hard to please and for them to say that this milk is good and I like it as well, I do recommend it to anyone. Also it's much healthier drink than regular flavored milks. The downside is that it's only available in-stores for a limited time. So hurry before they're gone!